It is everybody’s dream to run a business of their own. A fashionable kids clothing store is although a lucrative option, but it is not easy business unless you can learn the tricks of the trade. Everybody is into fashion these days and the kids are certainly not far behind, if anything, they are much more advanced than their predecessors. If you are interested in making brisk business, you absolutely need to offer your little customers variety of products from which to choose and for this you first need to find the best among the numerous wholesale kids clothing suppliers. Most successful kids clothing stores have a few things in common: a great selection of clothes and accessories, competitive price and eye-catching packaging. 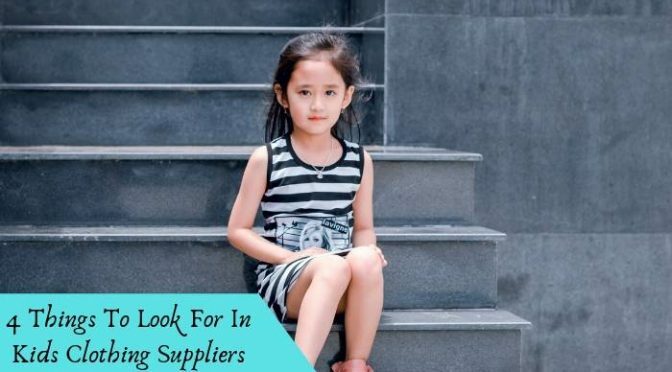 To be able to compete with other business competitors, it is imperative that you find the right kind of supplier among the many kids clothing suppliers in the market today. How do you do that? Here’s how. When searching for kids wear suppliers, look for the one that can provide you with the best quality kid’s apparel in affordable rates. The bottom line is that you need to make a profit selling those products to your customers and if they are priced exceptionally high, needless to say that your business would be suffering a loss. Kids are mad about fashion and they do follow the latest trends. Appeasing them can be a daunting task because they have their fixed design ideas and know exactly what they want. If you are looking to impress the wee ones, you have to provide them an inventory that is filled with variety, from toddler Easter dresses to summer dresses and shorts for the little girls. If your supplier cannot furnish you with multiple options and choices, it is time that you start looking for a new one! Whichever kids clothing wholesale supplier in Australia you choose, make sure that it can consistently supply you with A-1 quality products. Children are sensitive and when running a kids clothing store, one has to be exceptionally aware about the kind of products one is selling. Running a business is a hectic task and if you are dealing in consumer goods, you always have to stay ahead with a stocked up inventory at all times. The company responsible for supplying you with the required kids clothing should be equipped to handle tight deadlines and deliver within the agreed period of time. It should always be available 24/7 to answer any queries or emergency requirements that you might have. Impeccable service is what you should be looking for. There are many options available online. So, start searching!